Screen shot of the game Mrs Mop from Pretty Good Solitaire. 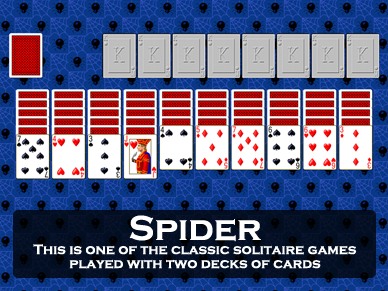 Mrs Mop is a Spider type solitaire game. At the start of the game, all of the cards in 2 decks are dealt out to 13 tableau piles, 8 cards to a pile, all face up. The object is to build a single foundation pile until all of the cards are in the pile. Cards are moved to the foundation pile in groups of 13 cards, a group down in suit from King to Ace. Once all 8 such groups are formed and moved to the single foundation pile, the game is won. In the tableau, building is down regardless of suit. 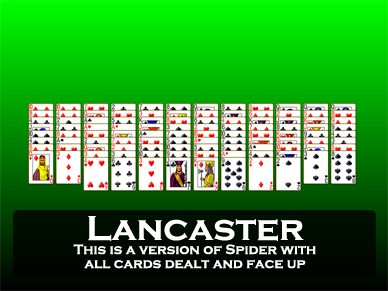 However, as in Spider, cards can only be moved in a group if they are in sequence down by suit. Therefore building in suit is preferred. Creating open spaces is very important. Work on trying to create one or two sequences. Once the cards from a couple of sequences have been removed, it gets a lot easier to manipulate the cards the form more sequences. 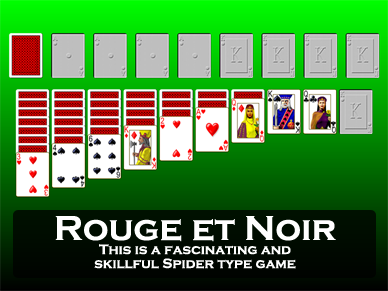 Mrs Mop was invented by Charles Jewell, who also invented the game Rouge et Noir. 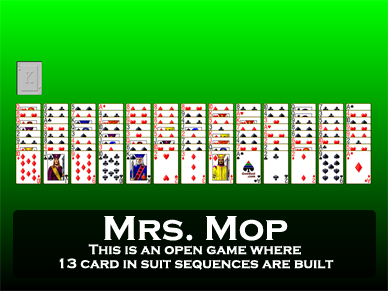 Mrs Mop is one of the 850 games in Pretty Good Solitaire.